About the Project World School Family Summits Your questions answered here! We feel it’s vital to facilitate worldschooling gatherings around the world, so that families feel supported wherever they are on their journeys. The Project World School Family Summits are designed as temporary community hubs where we gather in the spirit of community and co-create valuable learning experiences. The summits are designed as forum for all; from veteran worldschoolers to those who are just starting out as a place to add to our collective wisdom, share experiences, challenges and triumphs and support one another. These unique summits provide families with the confidence to head out on their own and come back together stronger and more resilient. The Project World School Family Summits are designed as space to connect with new friends on similar paths, who understand our unique worldschooling challenges, interested in alternative education, health and wellness, location independence, creating strong family relationships and family adventure. We get each other. We are community. We invite you to become a part of this dynamic community of families. …imagine discovering that the entire world is a learning opportunity, an infinite classroom brimming with an expansive supply of inspiration to learn from. …imagine deciding this is something you want for yourself and your family. …imagine a community of people who value experiential learning, development of personal and global awareness, practicing patience, being mindful of diversity and practicing compassion. …imagine the freedom to problem solve in real world situations, apply creativity, feel empowerment, practice leadership and be present in your own life and in the life of your children. …imagine feeling safe in the world and providing a sense of global citizenship for yourself and your family. this is worldschooling. Worldschooling is magic. The Project World School Family Summit is about coming together and forming community around that magic. What is the Project World School Family Summit? The Project World School Family Summit is a bianual gathering for worldschooling, homeschooling and unschooling families in all stages of their worldschooling journey. We’ve created a rich environment for like minded families to come together with purpose, be empowered, experience community, learn vital worldschooling trips & tricks and support one another and be supported. What will you experience during the Project World School Family Summit? Connection, understanding, insight and support are just a few examples of what you might experience at the Project World School Family Summit. Check out our Testimonial page to see what others have said about past summits. Who is Project World School? Project World School was created and ran by mother and son team Lainie Liberti and Miro Siegel. Together, they’ve been running worldschooling retreats for teens for the last six years and hosting the Project World School Family Summits for the past four. For more information about Project World School please visit thier site. Why were the Project World School Family Summits created? 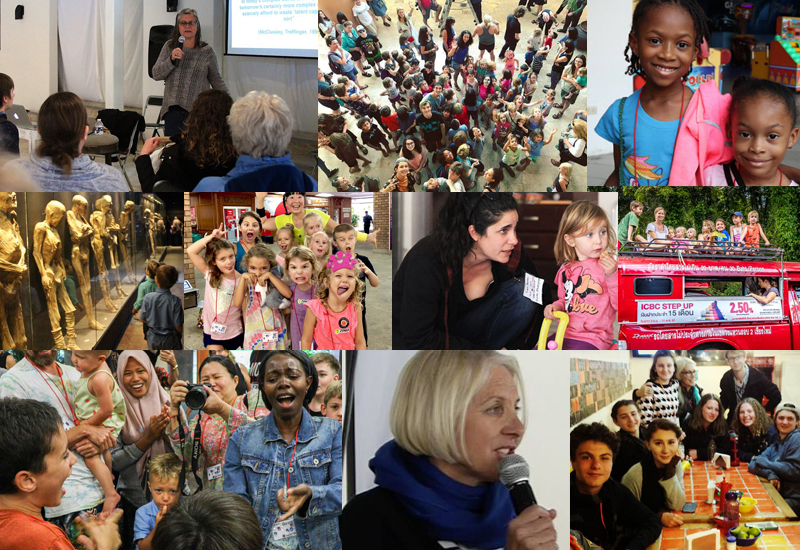 The Project World School Family Summits were created for one purpose: to create a stronger sense of community for worldschoolers by facilitating physical gatherings for a movement with no central hub. Our first Summit was only intended for 30 people. Over a hundred registered and particpated. Who were the Project World School Summits created for? The Project World School Family Summits were created to support worldschoolers, traveling families and homeschoolers and unschoolers, but are open to anybody who is interested in learning more about these forms of education and lifestyle. What topics will be covered during the Summit? Throughout the course of the summit, sessions surrounding location independence, education, family travel, family culture, worldviews, being in service and cultural immersion. All sesseions are hosted by members from within our very own community. For more information about the concept behind the Summits, please visit the concept page. When and where do the Project World School Family Summits take place? The Project World School Family Summits take place twice a year, with the Spring Summit happening somewhere in Latin America and the Fall Summit either in Asia or Europe. You can registrer here on our site. How early should I plan on arriving before and stay after the Project World School Family Summit? This is completely up to you and your family, but please keep in mind that there are generally activities (organized by Project World School and other worldschoolers) occurring in the weeks before and after the Summits and weeks, even months after. Often times, deep connections have been made and many families end up traveling together after the Summit. What do the Project World School Family Summits cost? The Project World School Family Summits cost $105 USD per person. The earlybird price ($89 USD) is offered for one month after the location is announced. Registration at the event is $155 USD. All tickets are non-refundable, but you can transfer your tickets to another family / person anytime before the event starts. For more information about ticket transfer, please use the contact form below. What do the Project World School Family Summits cover? The above fee covers admittance to every session throughout the week and entry to the kid’s camp for the young ones. Have Other Questions? Please send us a message and we'll get right back to you.